Talent Philippines: Global Village Ignites! While our cousins over at TDS (see below) are all about Call Center and BPO training, we take a different approach where we emphasize a more generic approach to learning. We figure not everyone wants a call center job so we've been hatching courses designed to help people succeed in any professional endeavor they may decide to pursue. Global Village is a little different than other outfits since all of our instructors are TESDA certified (as is our shop), we have about 20% native English speakers on staff (and they actually teach class), and we are all about the learners. We believe learning should be engaging, fun and relevant. Our first two classes are Interview Prep for the Real World and Business Communication for Professionals. Each course is designed to help you get ahead in a flattening world led by people who instruct from experience. (stay tuned for instructor profiles this week). Interview Prep for the Real World — You never get a second chance to make a first impression. Interviews are your opportunity to showcase talent and demonstrate your abilities as well as assess a potential employer. Global Village provides you with a week of inside information on how interviewers operate; assessments designed to identify and help you emphasize your strengths; and a portfolio of information to keep critical items at your fingertips so you can focus on the interview. Business Communication for Professionals.— In a globally connected economy, communication is the key to success. Knowing what to say as well as how to say it can make the difference for your career — wherever that may take you. Working with native English instructors, our workshop will prepare you to speak, comprehend and write with the confidence to move ahead. Come on down for a quick assessment and talk to us. We're near Ortigas on Shaw Boulevard near the corner of Pioneer & Shaw. Unit 304 Emerald Place Building, 604 Shaw Boulevard, Pasig City. Give us a call at 02.638.4819. Take a bus going to Shaw. (e.g.Crossing Ibabaw, Megamall, Boni, Mall of Asia). Get off at the EDSA Central Pavilion side of Shaw Boulevard. Ride any jeepney going towards Pasig or Antipolo. Tell the driver to drop you off at the Caltex gasoline station. Count down 4 buildings from the gas station. 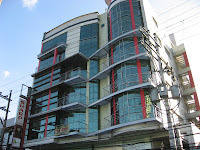 Our building is located right next to Pan de Manila. Take a South bound bus or MRT from North Edsa Station and get off at Shaw Station. Take MRT and get off at Shaw Station. On your way, you’ll pass by a Caltex gas station.